See changelog for details on individual releases before open source (4.2). 4.3 Beta CodePlex change set 25734 (release 81000) 10/7/2012 20.3 MB Installer wanted! 4.2 RC2 4.2.0.0 CodePlex change set 13011 (release 52341) 8/29/2011 22.7 MB Installer wanted! 4.2 RC1 4.2.0.0 CodePlex change set 12602 (release 52341) 8/3/2011 22.6 MB Installer wanted! 3.0 Release Candidate 0 3.0.5071.0 10/7/2008 12.3 MB Installer wanted! 3.0 beta 2 3.0.2968.0 6/25/2008 11.3 MB Installer wanted! Note from github.netmf.io: As of v4.4 of the framework (and the move to GitHub) the Porting Kit is no longer necessary so there isn't any porting kit release for V4.4 or later. If you wish to use the digital signature support in TinyBooter and MFDeploy, you will need the legacy Crypto Libs. 4.3 (Beta) * CodePlex change set 25734 (release 81000) 10/7/2012 56.5 MB Release wanted! 4.2 (RC2) * CodePlex change set 13011 (release 52341) 8/30/2011 53.2 MB Release wanted! 4.2 (RC1) * CodePlex change set 12602 (release 52341) 8/4/2011 52.2 MB Release wanted! 4.2 (Beta) * CodePlex change set 12002 (release 52341) 6/16/2011 52.0 MB Release wanted! 4.2 (Beta) * CodePlex change set 11937 (release 52341) 6/11/2011 52.0 MB Release wanted! An introductional document about the technology. A bit outdated, but still contais detailed information about implementation details of HAL and CLR and differences from .NET Framework. The licencing information is not up to date. Describes the general process of porting the technology either on your own hardware, or to an operating system. It discusses the .NET Micro Framework architecture from the porting point of view and the main purpose of this document is to give you an idea what the porting is about and whether it is really what you need. For 2.5 version only: A short introduction to DPWS and description of its implementation in the .NET Micro Framework 2.5. Contains a summary of the libraries and some basic examples in C#, on how to create a simple service, send and receive requests, attach handlers to events or how to deal with exceptions. Not of much use for newer framework versions, unfortunately no document update was published yet. First comprehensive literature about .NET Micro Framework available on the internet for free. It was created by Sean Liming as a manual to the iPac-9302 board, but it's worthy reading even when you are using another hardware. It contains an introduction to the SDK, working with GPIOs, emulator, SPI and other ports, network, extended weak references and also a short summary of the C# language. Hardware specific topics include ADC, PWM and 555. All this on over 200 pages with lots of practical examples, continuously updated. The document is no longer available directly, you can find it in the EDK firmware package. The second but no less valuable piece was written by Gus Issa from GHI Electronics, targetting the complete beginners. It goes into more details about C# basics and syntax, interleaving the chapters with examples directly from .NET Micro Framework. Due to the hardware differences from SJJ board, this paper adds chapters about I2C, SD cards and file system, network and USB client. GHI is popular for their custom implementation of missing features, so it is no surprise to see examples also to USB host, several displays, analogue I/O, 1-Wire® or CAN. And checking the missing topics list, there is still more to look for in the future! Comprehensive and de facto the only intermediate/advanced book about .NET Micro Framework in the time of version 2.5. The source codes are available for download. You will learn not only about the basics of the framework, but some advance topics as well - like localization, web services, cryptography, serialization, emulator components... altogether on more than 400 pages with hard cover. 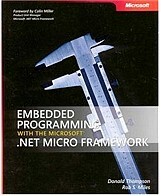 The very first book introducing the .NET Micro Framework. It covers basics of the framework and development process, the networking (these days availably only in emulator or by third party), and also the possibilities of user interface quite in depth. Then there is a chapter about Windows SideShow with some examples and introduction to the emulators and their creation. From the bigger samples let's mention Roomba iRobot or parsing GPS data. There are also some tips how to increase the code performance. This book contains everything you need to know as USB device developers. It describes how USB works, transfer types, device classes, descriptors, power management and even desktop drivers development. Although quite advanced book, it is suitable for beginners as well.